The Andes run longitudinally north-south through Ecuador, scything the country in two and dividing the steamy jungles from the warm, tropical Pacific coast. Within the chain rise dozens of volcanoes, several of them active. Visitors delight in the stunning scenery, shopping for colourful handcrafts which make wonderful gifts, and hearing the guides tell the stories behind each and every snow-capped giant along the way. Below, you will find our selected highlights found within the three main regions of the Ecuadorian Andes, running north-south. Two hours north of Quito, the market town of Otavalo draws visitors every week who come to this native community to shop at the world-famous handicraft market. The market, busiest on Saturdays but open every day, features a dazzling array of handicrafts including tapestries, hammocks, jewellery, paintings and colourful native clothing. Otavalo itself lies in scenic northern Ecuador, surrounded by volcanoes, rivers and lakes. For lodging, try one of the wonderful local haciendas:centuries-old estates now converted into elegant hotels. Two hours east from Quito in the Andean Cordillera, the reserve protecting the snow-capped Antisana Volcano and its surrounding ecosystem of moorlands and forests combines both relaxation and adventure. The reserve boasts stunning views of both the peaks of the Andes and the undulating forest canopy to the east. The Papallacta Hot Springs, located just outside the reserve, is a first-class complex including hotel, restaurant, resort and spa. (5,897 metres (19,347 feet) above sea level), with plenty of activities to enjoy, such as mountain bike or horseback riding, or simply relaxing in a nearby hacienda. 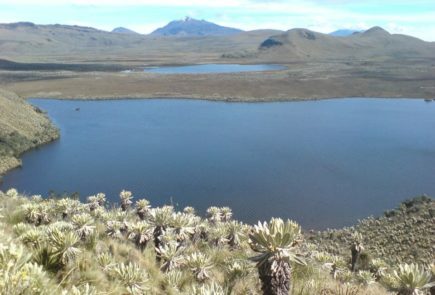 The volcano is protected by the Cotopaxi National Park, a sanctuary extending 88,920 acres, within which visitors can find out more about the Andeanpáramo or moorlands at the small Interpretation Centre and at the Limpiopungo Lagoon. 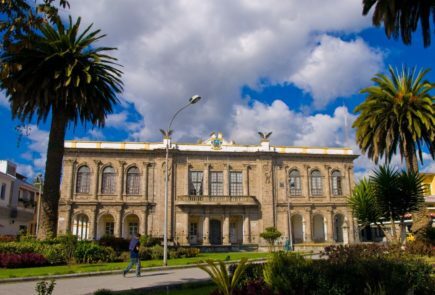 Beginning in Quito and heading south along the Andes’ spine, one travels along what the 19th explorer Alexander von Humboldt dubbed the “Avenue of the Volcanoes”: a journey full of breathtaking landscapes, cultural discoveries, ethnic encounters and culinary delights. The route passes through the provincial capitals of Latacunga, Ambato, Riobamba, Cuenca and Loja, bringing Andean people and lore to brilliant life as well as affording intimate contact with Ecuador’s natural wonders. The Central Highlands of the Sierra are dominated by volcanic peaks, including the highest in Ecuador, Chimborazo, which towers 6,310 m (20,702 ft.) above the surrounding countryside. Facing it on the Eastern Cordillera are Tungurahua and El Altar. This is a land of remote farming communities, of strong indigenous culture and lively weekly markets. Taking the road east from Ambato takes one down towards the Amazon Basin and the spa town of Baños, where the vegetation rapidly changes to sub-tropical, the roads wrapping round the mountainsides above roiling rivers. Cuenca, for many Ecuador’s most beautiful city, is located in a wide valley at an altitude of 2,550 metres (7,650 feet) above sea level. The capital of Azuay province, the city enjoys a mild climate and a fabulous geographic position. The beauty of its landscape combined with the harmony between old and modern architecture led UNESCO to bequeath Cuenca with World Cultural Heritage Site status. Cuenca is famed for its artisans and its crafts, and is home to many Panama hat workshops. Heading out beyond the city, the towns of Gualaceo and Chordeleg are also fun for shoppers, while Cajas National Park is great for those who love to hike and camp. Deep in the rolling hills of the southern Andes lies the Province of Loja. Here, life moves at a gentle pace as travellers visit age-old Saraguro communities, the rugged beauty of Podocarpus National Park and Vilcabamba, known as the Valley of Longevity, where one can glean insights into life, the universe and everything from its inhabitants who reach very ripe old ages indeed!